Mindless eating: The way to get children to eat their greens? Could "mindless eating" be the answer to the perennial problem of getting children to eat their greens, asks Denise Winterman. Most parents have experienced a tense stand-off with their offspring over a dinner plate, a floret of broccoli standing in the way of everyone involved getting on with their lives. But utilising a certain bad eating habit could be the trick to get your child to eat their greens, says one expert. Mindless eating is when you eat food without really registering it and nearly all of us do it, says Jane Ogden, professor in health psychology at the University of Surrey and author of The Good Parenting Food Guide. It's why many people overeat - they unthinkingly munch on what's in front of them regardless of what it is, portion size or if they're even hungry. But if it's properly controlled parents can make good use of it. "It's going to happen so utilise it," says Ogden. "When your kids are watching TV slip a bowl of chopped apple or carrots in front of them. Be casual, the trick is to get them to eat without realising what they're doing. If they eat carrots in front of the TV one day put them on their dinner plate the next, they can't argue they don't like them. Kids learn to eat food through familiarity, it's about getting them into the habit of eating fruit and vegetables. 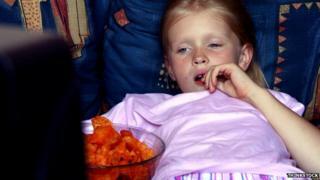 Snacking on rubbish is not good for children but eating fruit and vegetables between meals is not a problem." Make it as simple as possible, use food that is easy to hold and eat. Frozen peas are good, they can easily be popped in the mouth rather like Smarties. But like most things with children there is a golden rule, even if they eat their own body weight in broccoli don't make a fuss or a big deal of it. Praise will give them power and they will use it against you, warns Ogden. You'll be back to face-offs over those florets. Discover more about how to get children to eat healthily.